Custom sweaters, sweater vests, and embroidered turtlenecks from ePromos provide the means to outfit your staff comfortably. Our unisex designs cater to both men and women, offering consistency and cohesion throughout the workplace. Printed sweaters offer a look of polished professionalism that is not only ideal for everyday wear, but also for special occasions like presentations, grand openings, and important meetings. Allow our knowledgeable staff to help you find the perfect sweater or vest to match your company’s style or the sweater your employees will be proud to wear! We’ll get you want you need with the best business sweaters in the industry! A true refined favorite, this soft, breathable custom sweater can be dressed up or down for a variety of occasions. A true refined favorite, this soft, breathable custom sweater vest can be dressed up or down for a variety of occasions. Style and functionality come together with these classic Elevate Classic Cardigan Custom Sweaters imprinted with your logo. This men's Elevate V-Neck Promotional Sweater is a versatile piece of clothing that you can wear for work or casual days. High quality material that you can customize as a work uniform or promotional gift giveaway. This women's Elevate V-Neck Promotional Sweater is a versatile piece of clothing that you can wear for work or casual days. High quality material that you can customize as a work uniform or promotional gift giveaway. 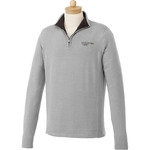 Add a twist to your corporate apparel with these Elevate Cotton Knit Full Zip Custom sweaters imprinted with your logo. Update your corporate look with these versitle Elevate Cotton Knit Quarter Zip Custom Sweaters imprinted with your company logo. Shield yourself from the cold weather with this Spyder Constant Full-Zip Custom Sweater Fleece. It features princess seams for a feminine silhouette and zippered handwarmer pockets to keep your customers warm and cozy. Keep employees warm in this women's Elevate Junction Packable Custom Insulated Vest! It features ECHOHEAT lining and a water repellent finish to keep recipients warm and dry. For ultimate convenience, this vest packs away into a stuff sack built into the left pocket. A classic fit Spyder Transport Quarter Zip Custom Fleece Pullover is perfect for an outdoor adventure. With a classic fit that delivers both comfort and style. Keep employees warm in this men's Elevate Junction Packable Custom Insulated Vest! It features ECHOHEAT lining and a water repellent finish to keep recipients warm and dry. Are you looking for a promotional sweater or custom vest that will make a great team uniform? Because when your employees look good, it sends the right message about your business. ePromos has a great selection of corporate apparel. Or maybe you need a pullover sweater for a trade show door prize? Giving away a stylish and classy look means your company looks sharp, professional and ready to serve your customers or clients. Or, maybe you need a custom sweater for a corporate giveaway or holiday gift? A gift such as this not only looks good, it looks great for your business when you choose the style and quality that reflects your company. Having produced millions of customized apparel items for corporations, schools, sports teams, not-for-profit organizations, businesses and individuals, we know corporate apparel. We know what looks good and we strive for 100% satisfaction. We will imprint your personalized sweaters with your logo using heat transfer or embroidery decoration methods. Because quality is the most important aspect for these two imprint methods, we make sure each logo looks good. We want the decoration (a reflection of your brand’s image) to make the sweater look better! In our online inventory of custom business sweaters, you will find all the latest styles of cardigan, coverup, full-zip, pullover, V-necks mock turtleneck, varsity and quarter-zip sweaters and sweater vests. These stylish and casual apparel items are available for both men and women in a variety of your favorite fabrics including: 100% cotton, cotton jersey, cotton blend, poly/cotton blend, acrylic or polyester. You can include your business brand on quality clothing from Cutter & Buck, Nike, Port Authority, Devon & Jones, North End and Sport-Tek. Not only do our products look good now, they will keep looking good, so your brand’s image continues to look the best it can be! Our team of Brand Consultants will do their best to assist you in any way they can, helping you choose the best promotional sweater, vest or turtleneck for your business – at the best price.